​​Lead singer of Jive house Linda Hunt has been vocally compared to the likes of Janis Joplin, Tina Turner, Etta James and Bette Midler, Linda can sing a sweet, beautiful ballad with emotion or a blues that reaches into your soul, but loves belting out a good old rock and roll standard. A vocalist with power and soul. Linda was also a backing vocalist for Jamie Redfern, touring NSW then Melbourne. Linda then accepted a gig with Sebastain Hardie on cruise ship The Ocean Monarch. Linda then formed a touring band called Velvet Morning. In 1964, inspired by listening to The Beatles, Rolling Stones, Cream, The Animals & Jimi Hendrix, Ted picked up his brothers bass and learned to play music. In the next decade Ted formed the band Clyde House, played with Band of Talabene, got to jam with some international and well known overseas musicians, and joined Flake for a tour to the NSW north Coast & Darwin. After leaving Flake, Ted went for an audition in a house in East Caulfeild with a band called AC/DC, and never bothered going back thinking they wouldn't get anywhere. In August of 1974 Ted auditioned Linda Hunt for a band he was forming, and they've been working together ever since. Their first band, The Infinite Air Band, entertained at the Smiggins Hotel Resort for 6 weeks, and then worked 6 months at Townsville's Lowths Hotel, backing different international and nation artists every week, such as Ronnie Burns and Joe Martin. Their next band together was Buzz Band, an almost totally originals band. Buzz Band worked for Living Sound records from Channel 9 Studios, alongside Dragon and many other big names. 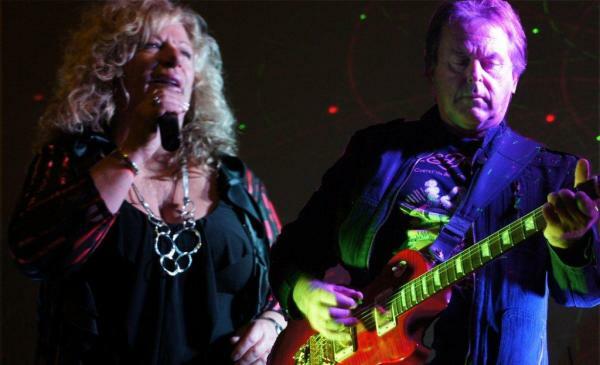 Linda & Ted have done so much in the music Industry, having played all over the country with many amazing musicians. After many line up changes in their band, they decided to go duo, with Ted moving from bass to lead guitar. They went on to produce a huge duo sound and have worked non-stop from Sydney to Eden to the Highlands on the Circuit as a duo for almost 18 years, always leaving their audiences wanting more.